These are semi-elastic couplings designed for general purpose use. Assembly is made quick and easy by means of a Taper bush. Fully machined outside diameters allow alignment through basic straight edge methods. 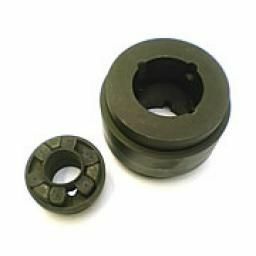 Taper bushes provide one of the most efficient and cost-effective methods of connecting components with shafts. The tapered end fits into a tapered bore in the coupling to be driven by the shaft and the locking action results from forcing the bush into the bore using axial grub screws.